There were tons of games on display at E3 this year. Some were playable builds that felt almost complete, some weren't much more than concept art. A few of those always rise above the rest, though. We already talked about the games we're looking forward to checking out before the end of the year, so now it's time to talk about 2015 and beyond. The first quarter is already filling up with what promises to be some awesome titles, and the release schedule beyond that has barely started unfolding. We've picked two out a the big list of games ostensibly set for release in 2015. We skipped a bunch, of course. Some of them might slip beyond 2015, but we're going to be generous. Hit the comments at the bottom and let us know what 2015 releases you're looking forward to! It's not even the drivable Batmobile that has me so psyched about the upcoming Batman: Arkham Knight, though that bit is exciting. It's the combination of Rocksteady returning to the helm and the use of new-gen hardware for the game's platform that's killing me. Flashback to the PlayStation presser and recall the gameplay footage we saw. Gotham is gorgeous, and Batman doesn't hit a single loading screen in the process of gliding about the city, entering a building's interior, leaving and calling in the Batmobile. My only hesitation comes from whether or not Rocksteady will change up enough to warrant yet another game in this series. The Arkham titles, even Origins to a certain degree, are all wonderful. However, we've beaten the path quite a bit over a relatively short time. I'm still having flashbacks to the recent Arkham games, and Arkham Knight needs to break the mold. Will the Batmobile and new-gen tech be enough? I don't know. At last. Ever since we first laid eyes on The Twilight Princess, I've wanted The Legend of Zelda to be taken to the heights that similar open-world style games have gone. Oblivion comes to mind as a comparable contemporary to what I've wanted to see Nintendo do with its beloved franchise, but two major console releases later, we're still stuck in the Nintendo 64 mindset in regards to how to create an open-world Hyrule. Well, no longer. This game of catch-up is over. The Wii U is going to take The Legend of Zelda into possibilities it has never been able reached before. Just look at that in-game screenshot and tell me that isn't gorgeous. Even the most stone-hearted naysayers in the world might struggle to not feel anything after seeing that. Producer Eiji Aonuma's art directors have nailed this one out of the park. All those mountains? You can climb them. All those villages? You can go to them. All those structures? You can enter them. Geez, I feel like we are listening to the hype train for the first Mass Effect game, just nearly a decade later. There are still so many questions about this game in regards to canon, gameplay, gamepad controls, and online components. Those can all be set aside for now. They are irrelevant at this point in time. Following E3, I just want to revel in that screenshot and pretend I'm questing in THAT Hyrule with Link once again. The Legend of Zelda is one of the few video game franchises in the world that can demand such emotion with a single image. But there it is, and I want to play it so badly. Told ya. Metal Gear Solid always shines when it is in development during E3, and this convention was no exception. Despite thousands of fans treating themselves to a leaked trailer the night before, Sony still proudly showed off the next entry in Hideo Kojima's espionage series durings its press conference. I had a lot of inhibitions about the latest game in the Metal Gear Solid series, mostly because of a worry that the tonal shift might have gone little overboard this time. When you can launch a goat sky-high into the air with a parachute, then pause and listen to a 14-year-old boy being tortured and sexually assaulted on an audio tape, then it is bound to raise a few questions about the legitimacy of a game's serious themes. However, one goosebumps-rising trailer and one fantastic demo showcase later, and I am totally on board. Only hearing the hype train and a few questionable recordings in the background of Ground Zeroes made me question his direction this time. Seeing the visceral images and horrific action emerge in front of my face though… that is an entirely new feeling, one which makes me nearly terrified to play this game. With shrapnel lodged in his head, Boss murders brainwashed child soldiers because it is either him or them. That's disturbing no matter how you look at it. This is not a world I want to envision, one which might make me feel very uncomfortable to play it. I'm not sure if that is a good thing or not, but I want to see how this masculine world populated of testosterone fueled soldiers of fortune falls apart. Metal Gear is finally about to come full circle within the series' canon with this game, and if Hideo Kojima is looking to go out on a serious note, then all arrows are pointing towards it happening. Truth be told, No Man's Sky sort of terrifies me. It's not that this is going to be a particularly scary title. Maybe it'll have frights, I don't know. It's that there's so much about it that remains in question. This procedurally generated infinite wonder is being developed by Hello Games. That's an incredibly small studio with a track record (pun intended) of Joe Danger. Hey, don't get me wrong, I enjoy the Joe Danger games. It's just that a bike trick and racing title next to something like No Man's Sky? "Ambition" is the word, I think. Through the trailers and media coverage, we know that No Man's Sky will set players on the outskirts of a grand galaxy or universe. Everything in the universe is randomly generated. It's procedural, too, so exploring further away from your start point means the creation of more planets, creatures, plants, ecosystems. Each planet is unique and can be discovered, supposedly without load times between space and the surface, by individual players. It looks wild, and it comes with an air of aging sci-fi tropes that are missing in today's games. 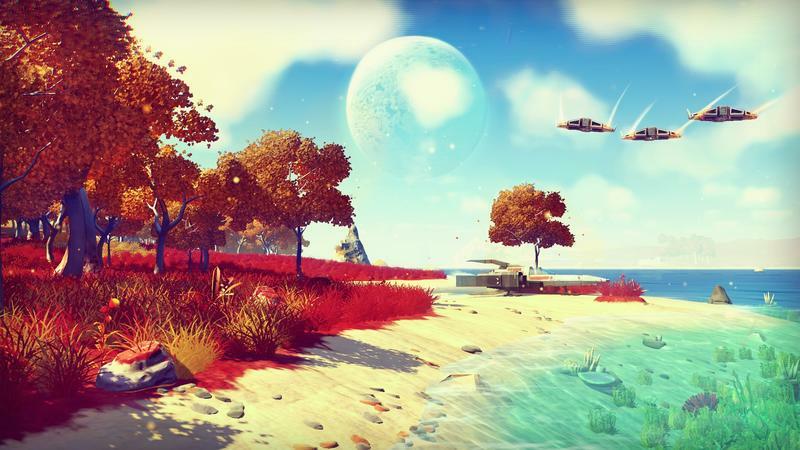 2015 could be nuts with No Man's Sky in the calendar. If it drops next year (that's if), it could be a title that soaks up the gaming time of a whole lot of people. New console generations have traditionally been the time where we see new IPs introduced. A new set of hardware gives all kinds of opportunities to introduce new ideas and game mechanics. Despite the Xbox One and PlayStation 4 both selling much faster than any previous generation, though, it seems like many of the big publishers have become increasingly gunshy. While we are seeing a few new franchises here and there, by and large we're seeing more of the series that became dominant in the last generation and those that were large before. We have more Assassin's Creed, a new Crackdown, more EA Sports – you get the idea. It's not that I'm not super stoked about all these. I almost put Crackdown here instead. I was happy to see Microsoft headlining not only a new game from Platinum, one of the most entertaining game developers out there, but a new property altogether: Scalebound. Yeah, it was just a CG teaser, sure, but we can get a few ideas from it. Since Scalebound is a Platinum game, we can say with some certainty that there will be some crazy, high-flying action. It's nearly a given with this studio, but the trailer pretty much confirms it. While some recent Dragon games haven't been as dragon-heavy as their names might suggest, it looks like Scalebound has your character directly connected to a dragon, fighting alongside and hopefully riding it. The dragons themselves gave me a Panzer Dragoon vibe. I know this isn't going to be Panzer Dragoon, but I still crave the weird take on science fiction and fantasy those games had and would love to see anything that even approaches it. Not only that, but the end of the trailer seems to suggest that the game might have multiplayer as well when it shows all those dragons rushing the gigantic hydra, something that would be a fairly new move for the studio. With or without multiplayer, though, I'm definitely looking forward to seeing how Scalebound comes along. When you spend as much time staring at gaming news as we do, it's easy to feel like you can tell the future. I'm having a tough time seeing past February 24, however. I'm blinded by the recently delayed, but still very much impending, release of CD Projekt RED's The Witcher 3: Wild Hunt. I've been looking forward to it since its announcement, but seeing it at E3 this year has me convinced it'll be, if not an instant classic in its own right, then at least one of the best games of the year. Trilogies are kind of the thing nowadays, and Witcher is no different in that regard. It seems, though, that the general formula to trilogies is to establish a set or rules in the first one, perfect those rules in the second, and then iterate on perfection in the third to varying degrees of success. Series like Uncharted, Assassin's Creed and Batman: Arkham all come to mind. CD Projekt RED has never been one to follow any traditions but its own. The Witcher had humble beginnings, running on someone else's engine. Somehow it hit critical mass by word of mouth. That enabled the sequel to move to a new engine built just for it and the developer put out one of the best-looking games of the year that expanded and improved on the original in a variety of ways, opening up the world a bit and changing up the combat. While The Witcher 3's story is a direct sequel to the first two, it expands the Witcher world in ways the first two couldn't have hinted at. Instead of a series of connected areas with gateways, we're presented with a massive open world. The world is populated with intersecting quests and character as well as a hunting mechanic that expands on Geralt's job as a witcher. Despite the huge expansion of the game, detail doesn't seem to have been left behind. A brief tour of a city showed detail we'd expect from a smaller game. CD Projekt RED has promised over 100 hours of content to be enjoyed in Witcher 3, and I plan to squeeze every last drop out this winter. I would never have guessed that my favorite title from Sony's conference this year would be a 16 year old adventure game, but here we are. Grim Fandango left a strong, immediate impression on me. It had stellar art direction, voice acting and writing especially for a game of its time. The game was built with an aesthetic that combined Art Deco and Day of the Dead and somehow made them both work in this weird Noir story. It's an important part of gaming history and I'm glad to see the long lost property getting a second life and a chance to inspire the same kind of love for adventure games that I have in new players. When it comes back, Double Fine not only has the chance to update the graphics to a higher resolution that will look good on modern displays, but also to update the horrible tank controls they tried to use to replace the standard point-and-click of adventure games that came before. Those controls were really the only part of the game I had any criticism for. I can't wait to step back into the coffin that belongs to the travel agent for the dead, Manny Calavera, as soon as possible. I was one of those who actually really enjoyed Kirby's Epic Yarn when it released for the Wii. The effort from Good-Feel was one of whimsy, good looks and simple playability. Put plainly: it was fun. Yoshi's Wooly World looks like it'll scratch that same itch, and doing so in HD actually helps the yarn and wool effects tremendously. The biggest news with this game, as far as I'm concerned, is that Takashi Tezuka is back on the billing. He's the same developer behind the original Yoshi's Island, an effort many regard as one of the best on the SNES. Hopefully Yoshi's Wooly World is closer to the SNES game than it is the recent 3DS entry. Yoshi's New Island just seemed uninspired to me. What I've seen of Wooly World so far appears to be quite the opposite.